HCM City (VNA) – Politburo member and Secretary of the Ho Chi Minh City Party Committee Nguyen Thien Nhan has stated that improving the efficiency of cooperative ties between Ho Chi Minh City and the German city of Frankfurt not only benefits both sides, but will also develop Vietnam-Germany relations. During a reception in the city on April 1 for Mayor of Frankfurt Peter Feldmann, Nhan suggested that the two cities seek out common areas to reinforce their cooperative ties, especially in trade, technology, and education. He said Ho Chi Minh City wants to acquire experience from Frankfurt as a major financial hub of Germany in order to build its economic development model for the future, oriented at transforming the city into a financial and trade centre for the country and region. According to Nhan, the two cities hold great potential to intensify relations in fields of shared concern, such as science-technology, IT, tourism, healthcare, green energy and smart urban development. Feldmann, for his part, said that Frankfurt shares many similarities with the city of Leipzig – which signed an agreement on the establishment of friendly and cooperative ties with Ho Chi Minh City – and as such, room for joint work remains huge, particularly in fair organisation, IT, artificial intelligence, seaport logistics, chemicals, and renewable energy. 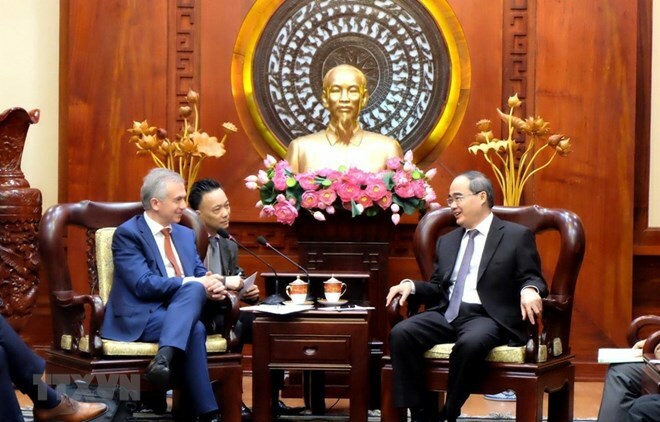 He suggested that Ho Chi Minh City should partner with Frankfurt in waste-to-power technology, power transformation and storage, and eco-friendly urban development. Frankfurt is willing to share its expertise with Ho Chi Minh City in building a financial centre and a master plan for urban transportation, he said. During the stay, Feldmann is due to hold a working session with the municipal leaders, as well as visit the Vietnamese-German University and Quang Trung Software Park.